One of the shows on my personal most-anticipated list for the season opened Friday, and I’m still digesting the experience. 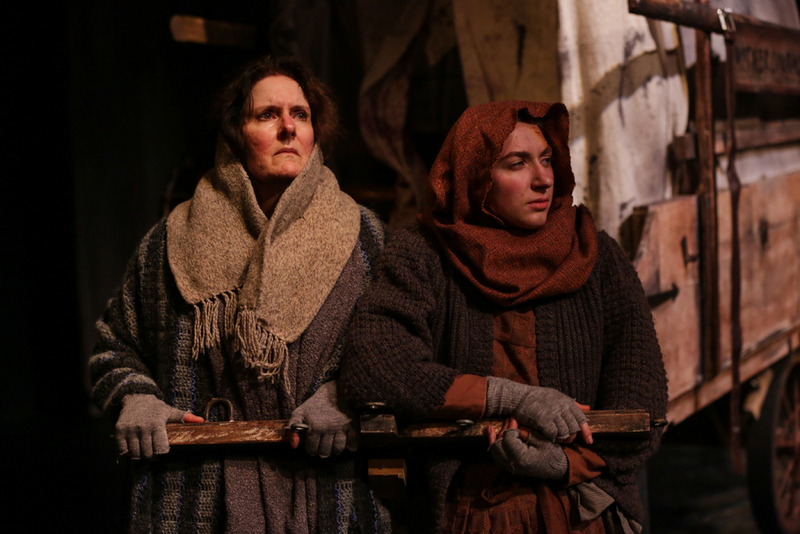 Staging Mother Courage and Her Children, which is on the boards now at Seattle Shakespeare Company, is not an effort to be undertaken lightly. This is, aside from their 2011 production of The Threepenny Opera, Seattle Shakes’ first time out with the work of Bertolt Brecht. Obviously at home with the dislocations and built-in “alienation effects” inherent in Shakespearean dramaturgy, the company brings to the challenge a valuable perspective from its long experience with the Bard. An unconventional, class-focused production of Coriolanus that Bertolt Brecht saw in Berlin in the 1920s (directed by Erich Engel) was, after all, one of the formative influences on the German playwright’s ideas for a radically new kind of theater. Directed by Jeff Steitzer, this production uses the acclaimed translation David Hare prepared for a Royal National Theatre production in 1995 (directed by Jonathan Kent). That choice establishes a basic interpretive grid from the outset. 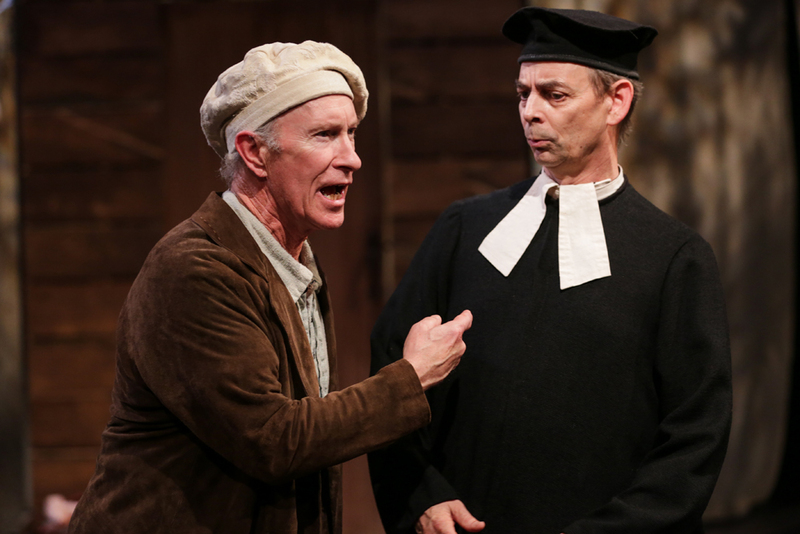 Hare’s version underlines the caustic, cynical humor of the text, mostly leavening any hint of preachiness in the longer philosophical asides with a theatrical tartness reminiscent of Samuel Beckett. Could it be that some variety of humor — the more acid-etched, the better — is our preferred modern form of “alienation”? A couple of topical references depressingly bring home how little has changed over the past two decades. 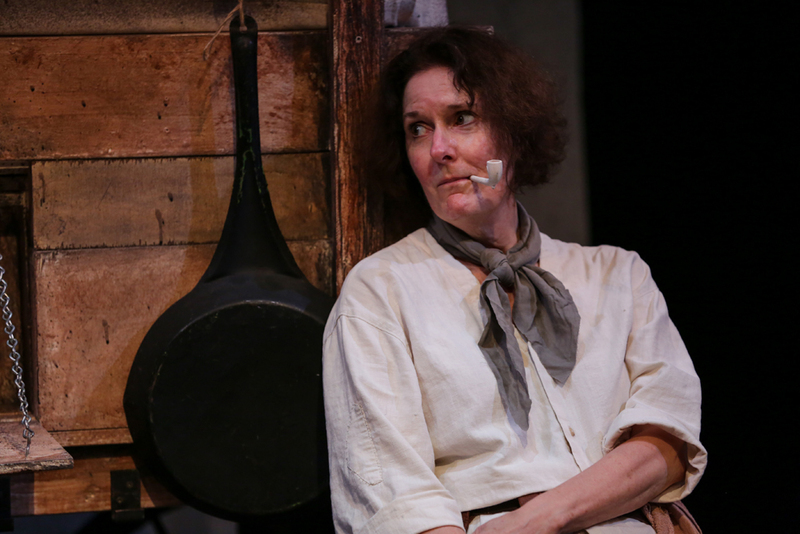 In fact the most “Brechtian” aspect of this Mother Courage might be how it shows the ease with which the condition of war becomes normalized — in the ways it gets talked, even joked, about, justified, maneuvered around. No matter how far we like to think we’ve advanced since Brecht’s masterpiece was first produced in 1941 (in neutral Zurich, in the middle of war-torn Europe) — or since the play’s setting in the Thirty Years’ War (1618-48), for that matter — the headline news of today’s refugees unnervingly echoes the grim plight of those caught up in those historical conflicts. Mother Courage is a play, and a project, riddled with paradoxes that are necessarily insoluble — starting with Brecht’s theoretical aims versus realizing the play in praxis. One of these is the (very Shakespearean) ensemble nature of the work which at the same time requires a “star” quality performance to make the role of Anna Fierling (nicknamed “Mother Courage”) work properly. That’s what Jeanne Paulsen delivers in her unflinching, gritty, sentimentality-proof portrayal of the intrepid matriarch whose idée fixe is to make a living and get her three children — Eilif, Swiss Cheese, and Kattrin — through the war. But the living she makes by trading from her moveable canteen turns out to be most profitable when nations are at war, so Mother Courage is not to be thought of merely as a pitiable victim of the violence — even if she ends up losing all three children to it. That’s the paradox anyone who takes on the role has to cope with, and Paulsen emphasizes how this contradiction has hardened Anna into a position where her own cynicism is among her most potent weapons of self-defense. Paulsen’s steely-tempered Anna delivers her repartees with the deadpan timing of a 17th-century Bea Arthur. She has no need of a Shakespearean fool — it’s the character inside her who comes out with devastatingly witty responses to the war. We see Paulsen’s Mother Courage endure unbearably cruel experiences, yet at her core she’s already been numbed from the beginning. Seattle Shakes has assembled an admirably strong cast to counterbalance Anna’s powerful personality with other vivid character portrayals and effectively paced ensemble work. Trick Danneker gives the elder son Eilif a touch of a dark-spirited Candide, swiftly corrupted by his success at slaughter but too slow to learn the rule of moral relativism that holds sway. Spencer Hemp plays the good-natured Swiss Cheese like the ill-fated hero of a Brechtian fable. As the mute, genuinely heroic daughter Kattrin (in a world where heroism is a sick joke), Chesa Greene does superb work inhabiting her character to life with only gestures and body language. Larry Paulsen, who accompanies Mother Courage through many of the play’s peripatetic sequence of scenes, reveals the complexity Brecht built into the Chaplain — exactly the sort of character you initially expect to remain a nasty caricature of the evils of religion doubling as an excuse-maker for war. While he doesn’t disguise the Chaplain’s cowardice and opportunism, Paulsen underscores his contradictions, which are almost as imposing as Anna’s — including a sense of compassion he develops in contrast to her stuck-in-place cold-heartedness. R. Hamilton Wright makes a terrific Cook, an everyman with a well-developed carapace of cynicism as well as a philosophical streak that can match Anna. Alyssa Keene’s Yvette, showing her own ways to profit from the war, also brings to mind a few scenes of Candide in her cartoonish arc from pneumatic camp prostitute to plump, rich widow. Reacting to the first of her children’s deaths (just before the one intermission taken in this production), Paulsen retreats inside her wagon and lets out a searing cry of anguish — heard but never seen, for as Mother Courage her entire survival strategy requires a constant facade of acting, never revealing true emotion. It’s a wrenching moment that crystallizes the larger issue that looms over any production of this play: the paradox of Brecht’s epic theater of ironic emotional detachment versus the urge to feel sympathy for Anna. Steitzer’s staging essentially opts to set this contradiction aside, with only a few token efforts at creating “alienation”: the bare-bones set design with curtain (Craig B. Wollam) and some over-the-top stylizations of ancillary characters like the Commander-in-Chief Bill Johns) who mentors his young warrior Eilif. Otherwise the dramaturgy and design (including Doris Black’s period costumes and Rick Paulsen’s lighting) aren’t really too far off from the staging of a Shakespeare play. 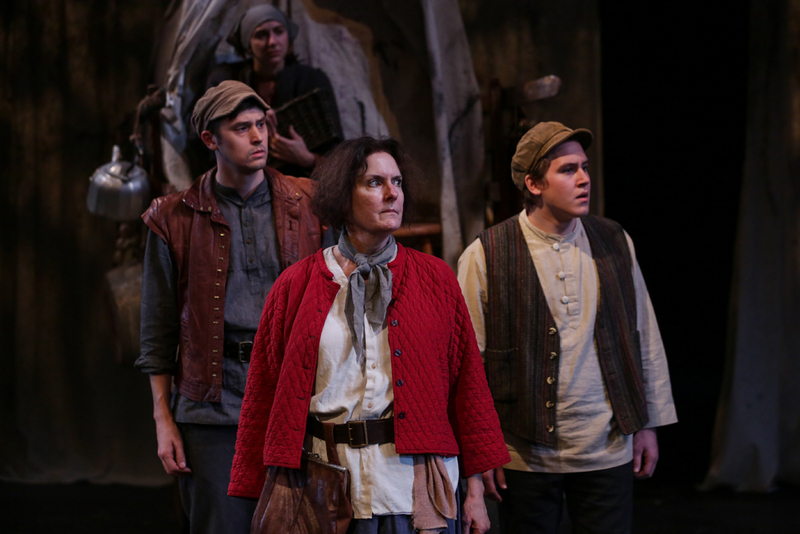 If you go: Seattle Shakespeare’s production of Mother Courage and Her Children plays at the Center Theatre at Seattle Center (305 Harrison Street, Seattle) through 22 November 2015. Tickets here.